A slide show of photos of Westmoreland’s journey to the dry dock can be seen by clicking on the Westmoreland page title above. More information in a newsletter shortly. The lovely 130 year old minature Thames Barge SB Cygnet visited Standard Quay at the end of last week and, much too everyone’s delight, set off down the Creek under sail alone. We went with her a little way on Mac’s ‘Markie’ to take a few pictures. She is I think, the last barge with a tiller (our own Lady of the Lea briefly returned to her tiller sailing days when she starred in Leon Garfield’s ‘December Rose’, a BBC Children’s drama series filmed in the 1980s). 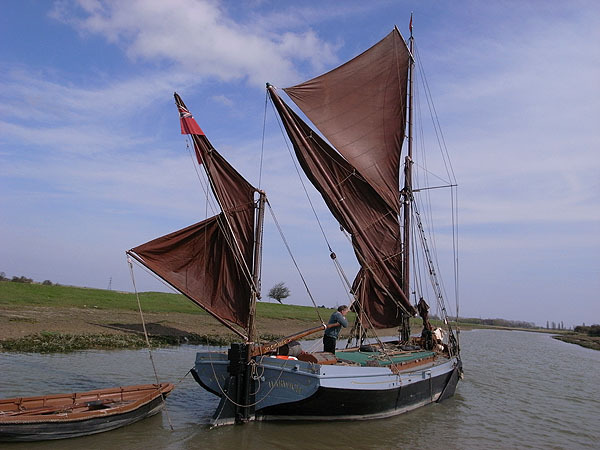 There is a useful potted history of the Thames Barge with an honorary mention of Cygnet here: http://phillipsdesignpublishing.com/section439711_154492.html . She did sail from Standard Quay, but my camera decided it would only work from the Iron Wharf on so I don’t have the shot I took of her sailing past the massive SB Lady Daphne looming over her from her perch in the Standard Quay dry dock. If anyone has any shots of the Cygnet on the Quay we’d love to have them on the site. As we were going past Iron Wharf I took a quick snap of work in progress on SB Cambria – she won’t be stumpy rigged for long. 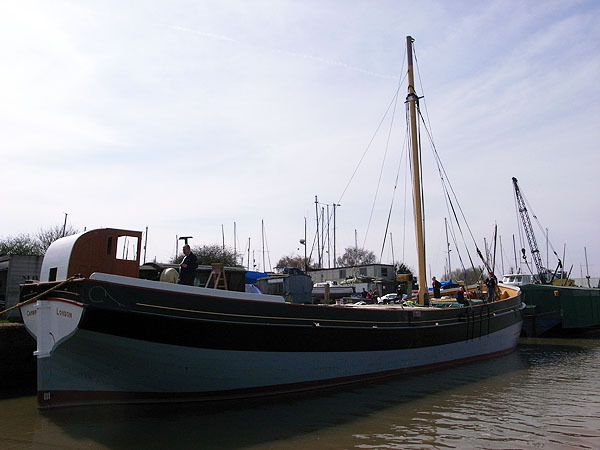 We are looking forward to the day in a couple of weeks when she returns to the Quay in all her newly rigged glory. The next big date in the Save Standard Quay diary is this Wednesday, 6th April, when I, as the E Petition organiser, am to meet up with our landlord Mr White at the Borough Council offices at Swale House in Sittingbourne. We are taking up the offer of Swale’s Director of Regeneration, Pete Raine, to mediate between us. This came offer was made at the LEF meeting of 15th March. It should be interesting. A newsletter will follow. Talking of newsletters, we have made an Archive page where past issues of the newsletter can be found (including the two issues numbered Issue 3 (sorry, we lost count for a minute there). We are also working on a way of making the petition on this site accessible (together with the petition as it was at Swale when it closed), to everyone who has signed it and will let you know when we have figured that one out. At about 12.30pm a cheer went up from the 50 or 60 children from Ethelbert Road Primary School who were sitting on the North Bank of Faversham Creek. They had spotted a slight movement as the Cambria lifted off the blocks. Half an hour later, after a few sticky moments as she squeezed out of her customised cocoon, and another great round of applause rang out, hooters sounded and the children’s home made flags waved frantically. It could have been a scene from the Faversham’s ship-building heyday when half the Town flocked to the banks to watch the Sideways Launches from Pollock’s shipyard opposite Standard Quay, or crowd onto the new barges as they were launched from Goldfinches Barge Yard, which was approximately where Cambria launched today. SB Cambria is now nearly ready for her new life in education, passing on all of the many skills she embodies. We have put a few pictures of the event up on a new page and hope to add more later – there were a lot of people there with cameras! The Cambria is due to float gently out of her dry dock tomorrow. It won’t be a spectacular occasion, not like the Sideways Launches Faversham was famous for in years gone by. But it will be a poignant moment for many of us. 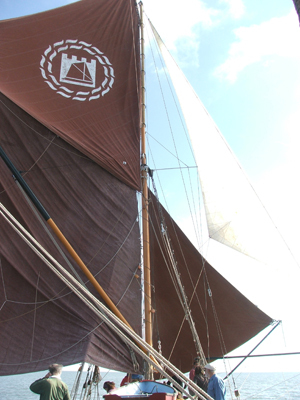 The Cambria was the last Thames Barge to sail in trade. 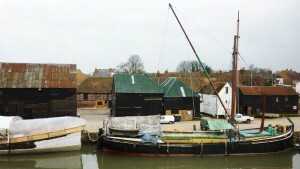 Will she be the last barge to be rebuilt at Faversham? 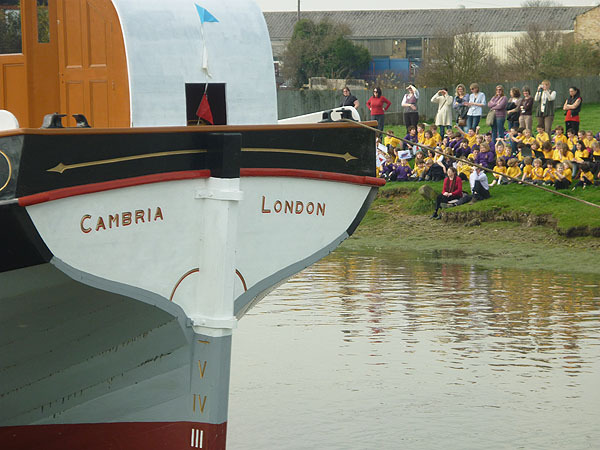 At about 12.45pm, 21st March Cambria will float out of the dry dock in which she has spent the past three years undergoing complete restoration. Cambria has become an important part of life in the Town and on the Quay during that time. She was the catalyst for the setting up of the apprenticeship scheme run by Standard Quay Shipwrights, the not for profit company set up in one of the simple wooden sheds on the Quayside for this purpose. The apprenticeship scheme is now in severe danger as, rather than being now firmly established with the apprentices continuing to work on other large wooden vessels in desperate need of the skills they have learned, the doubtful future of Standard Quay has led to the work being halted. Projects already booked in to the dry docks will keep them busy until the middle of June, but after that, the future looks bleak. Funding already granted by the Headley Family Trust for the scheme’s future is on hold while alternative premises are sought. The grant from Swale, given to the Cambria Trust, has been withdrawn. No contracts or long term leases have been offered to anyone on the Quay which would enable the scheme to continue. The reason the apprenticeships are possible for boat repair and maintenance at Standard Quay is because of the size of the projects involved. Normally, boat building courses cost about £10,000 per year but at Standard Quay the apprentices are paid as they learn, because they can help with the massive size of the projects. 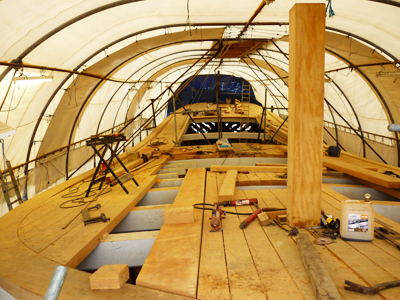 No piece of timber on a deck, sides or bottom of a Thames Barge is exactly the same. It is not like building a house with identical rooms. But it is repetitive enough that, once the basic skills have been learned, an apprentice can be a productive member of a ship-building team on a large project. Such large scale projects will not be possible if other activities such as restaurants and shops and ‘public amenity areas’ are added. Large vessels need large timber. Large timber needs craning, it needs storage space on land and you don’t always want to keep it in exactly the same place. You can’t go around with massive baulks of timber dangling from a crane in front of a restaurant full of people swigging gin and tonic or try to avoid the BMWs parked on the free car park. 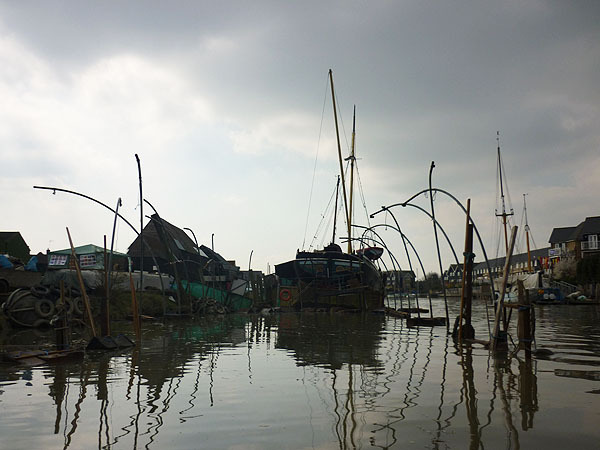 Once these kinds of activities are on the Quay; once the last bits of land that surround it have housing built on it, there will be no more Cambrias launched here. She will be the last big vessel launched on Faversham Creek. Does this really have to happen? Please ask Swale Borough Council’s Pete Raine (Director of Regeneration) or James Freeman (Head of Development Services) what they are doing to safeguard these jobs and apprenticeships in Faversham’s centuries old ship-building tradition. There are elections coming up. Please write to your local Councillors or anyone standing for election and let them know that the future of Standard Quay, the skills and employment here and the real regeneration of the rest of Faversham Creek should be in the hands of the Town and not the hands of the Developers or of the Borough Council. Faversham people regenerated Standard Quay, but we are about to lose it. When we do, there will be no more Cambrias. Thank you to everyone for all your support at, and leading up to, the meeting last night. I am not sure, but I think they ran out of chairs. It was certainly a fuller hall than normal! I think that our message came across and if it did, it’s down to all the support we have had from everyone close to home and around the world. While I was panicking before leaving the house for the meeting my daughter told me not to read the speech I had sketched out. “For Goodness sake, I’ve heard you rant endlessly about it. What do you need notes for?”. (she’s a teenager so that’s edited for publication). A friend reminded me that the real issue here is all the Faversham people who make the Creek what it is. And to crown it all we had a lovely message of support from Brasil just ten minutes before we set off. All of this, and all of your support over the past few months helped enormously. I am not normally a confident public speaker. Perhaps the Council will now begin to look for ways in which they CAN help, rather than giving reasons why they can’t.